Traveling around the world, learning, networking, sharing – that’s what GeeksOnAPlane (GOAP), a field trip of sorts (which takes place a couple of times a year), is mainly about. This time, the tour is leading a group of 30+ geeks (mainly from the US) to no less than five tech hot spots in Asia: Shanghai, Beijing, Seoul, Singapore, and Tokyo. I am joining the trip as an embedded blogger, exploring the current trends in Asia’s web and mobile world, and the implications of the Asian tech revolution for the industry in the US and elsewhere. The GOAP already got a first crash course on China’s Internet landscape from a number of local VCs, entrepreneurs and tech journalists we met in Shanghai, the first leg of the tour (which ended yesterday). 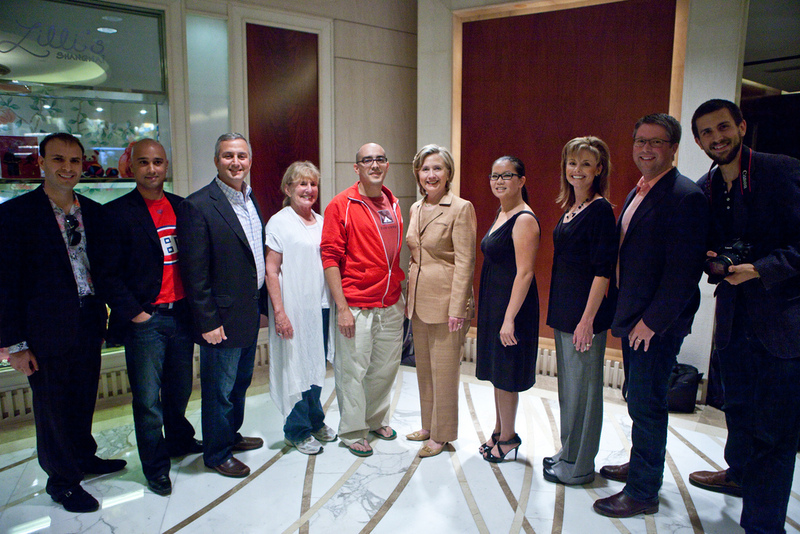 This part of the tour included Silicon Valley-based investor Dave McClure (who brought GOAP to life) pitching the StartupVisa movement to Secretary of State Hillary Clinton at the Shanghai Expo 2010 (see picture above), an “East meets West” blogger meetup, witnessing the first ever “Ignite” show in Shanghai, taking part in a Mobile Monday event, and networking at a Startup2Startup Dinner/Fast Pitch event in downtown Shanghai. One of the main takeaways is that the web and mobile market in Asia is not only huge already, but that it’s poised to become even bigger in the future. The spectacular growth is fueled by a large reservoir of entrepreneurs, a huge potential customer base and both local and international investors looking for the next big thing to come out of Asia. Everybody the GOAP met in Shanghai was bullish about Asia’s online future – for a good reason. Take some recent web usage statistics, for example. Asia already boasts the most Internet users in the world (764 million out of a global web population of 1.8 billion people at the end of last year). And while North America has an Internet penetration of around 76%, many Asian countries are still largely offline: according to some sources, the Internet penetration for Asia as a whole stands at a mere 20%. There is little doubt that China in particular will continue to play the biggest role in the region. The country has 400 million (and counting) Internet users and a whopping 770 million cell phone subscribers. In other words, China not only boasts the world’s largest Internet population (the US is second with 248 million web users), but it’s the world’s biggest mobile nation, too – by far (there are 585 million handsets used in India, and 285 million in the US). And even in China, there’s still a lot of room for growth. Take the mobile market as one example. According to some pundits the GOAP met in Shanghai, many Chinese people with low income (especially those living in rural areas) skipped buying laptops in recent years but access the web through their cell phones instead. Yet, “just” 200 million people access the web through their cell phones, and just 20 million Chinese users are on 3G currently (that number is said to balloon to 150 million next year). Make sure to check out the rethink: Shanghai homepage for substantial information about what’s currently happening in China’s tech scene. I’ll be summarizing what the GOAP learn in Beijing (the next stop of the tour) and the other cities over the next few days here on TechCrunch. For information in real-time, follow the adventures of the GOAP via the #goap hash tag (the official Twitter account is here). GOAP pictures are being uploaded regularly over on Flickr.